Once a bamboo grove starts to mature, pruning will help its overall health. This is done to prevent the overpopulation of canes and removal of canes that have reached the end of their life cycle. Canes typically last for about 10 years. Removal of these canes and other undesired canes will help stimulate and provide space for new growth. 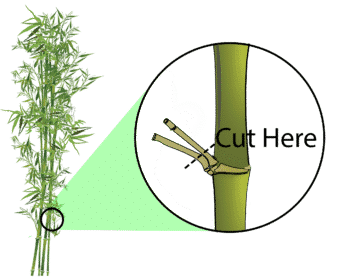 Pruning is not usually required until the bamboo has become established. This is generally after your 3rd to 5th growing season. 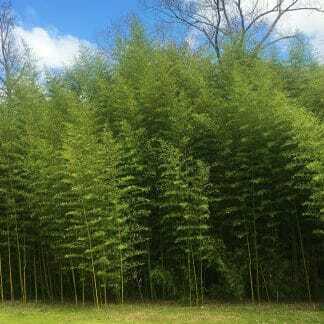 The time that it takes bamboo to get established can be dependent on many factors such as planting area, species, climate zone, water, sunlight, and soil. If you are unsure, go slow and just remove a few and wait for the response in your next growing season. You can always remove more, but it is difficult to force new growth. It is important to keep in mind your ultimate goal. If you are using bamboo for a screen, don’t sacrifice your privacy just to cut some canes. If a cane has foliage, it is still viable and producing energy for the grove. The more energy the grove has, the greater the potential for new culm production. However, if you are wanting a nice walk through grove, canes can be removed to accommodate. You may also trim limbs to allow easy passage. 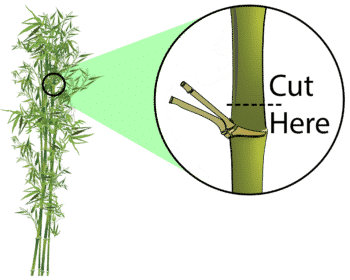 Pruning can be performed anytime during the year. However, it is not advisable to prune during the shooting season because of possible damage to new shoots. 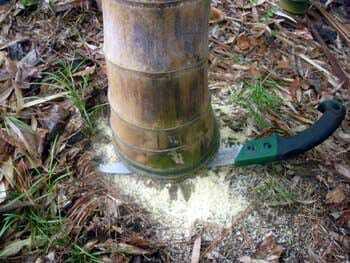 Bamboo can be removed with most any handsaw. You can see from the picture that even the largest of canes (that is a quarter sitting on the stump for perspective) can be removed with simple tools. Make sure that you have all the safety gear and proceed with caution. Bamboo is typically lightweight but can still be dangerous. It is recommendable to step back and take an overview of the grove from a distance. This will allow you to gauge its overall health and properly identify failing culms. 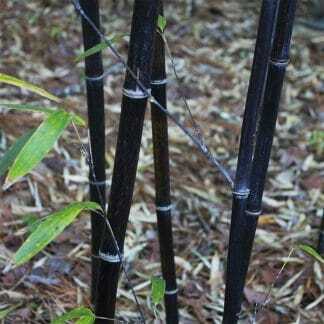 After marking problem culms and deciding on how you want your grove or screen to appear, you can begin removing canes. Remember to cut at ground level or go back and trim the stump flush after removing the cane. This will prevent any tripping or falling hazards. You can remove all the failing canes (brown canes with no foliage) without any damage to the grove. 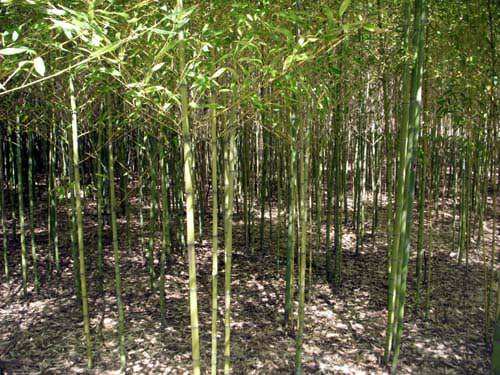 However, removing more the 1/3 of good canes will effect the bamboo grove’s health and ability to produce larger canes. You can also top (remove the upper portion) bamboo to create a lush topiary appearance. Once topped, bamboo will never grow vertically again. 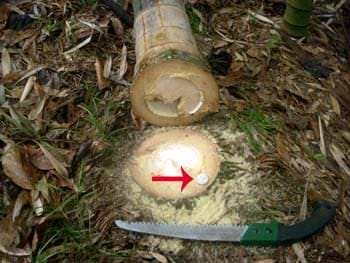 Bamboo doesn’t experience secondary woody growth like a tree. Once the bamboo is topped, it will remain the same height for all of the cane’s life cycle. 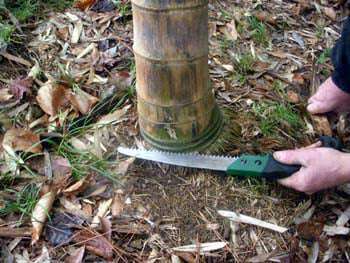 Make sure that you leave some viable limbs and cut about 1/4 of an inch above the node when you top bamboo. Without limbs the cane cannot survive. It is usually best to leave 3 or more sets of limbs for the cane’s health and appearance. These limbs will generate more foliage to compensate for the loss of height. This will cause the bamboo to attain a very different look. Bamboo that has been done this way typically appears very lush after a few years of the increased foliage production. The picture to the right is of Phyllostachys Viridis. 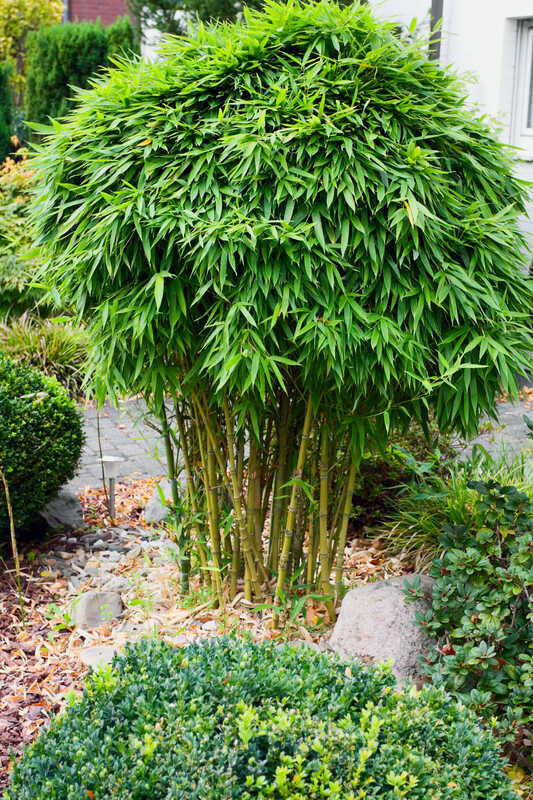 This is a giant bamboo, but can me manipulated to have a unique appearance. Bamboo can be manipulated to achieve almost any appearance. This is Phyllostachys Aurea ‘Golden Bamboo’ pictured on the left. It is a bamboo that generates very low limbs but the limbs can be trimmed up to any desired height. This process is also called ‘legging up’. Once cut these lower limbs will never grow again. 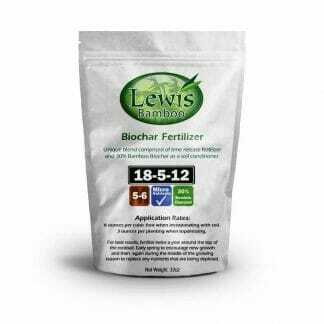 This can give you a very uniform look and has many applications. This technique is used on many species that have interesting cane colors and/or stripes. The lower limbs are removed to expose the interesting characteristics of the canes. Many customers purchase bamboo to be planted in front of an existing privacy fence to attain privacy above the fence height. Using the legging technique, you can trim the limbs until the level even with the top of the privacy fence. This will allow you to enjoy the canes with a backdrop of the fence and have the lush privacy the foliage provides at a higher level.